Now that the Supreme Court has ruled ObamaCare constitutional, MSNBC has redoubled its efforts at promoting the president's signature legislative accomplishment to its audience. On Friday’s 2 p.m. Eastern NewsNation program, guest-host Thomas Roberts brought on a cancer survivor to fawn over Obama. 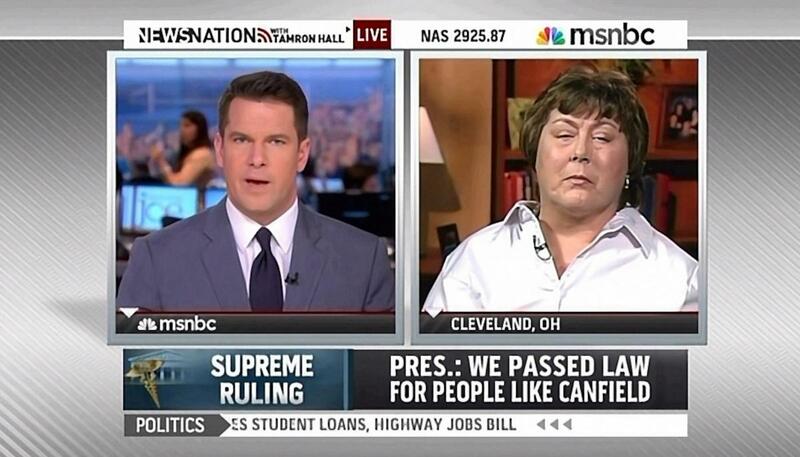 Natoma Canfield, who thankfully is cancer-free, was prompted by Roberts from every angle to praise Obama and go on at length about how much credit she gives to Obama for saving her life. Thomas then followed this up by telling his audience how Canfield is "one of the millions of Americans who have already benefitted from this law." What goes through your mind, though, when you hear people on the right? People out there across this country that may not understand exactly what the Affordable Care Act does, and they want to repeal it. They're angry about it. What is your message to them? Roberts guided the interview to a position where he could lay out his usual smear on conservatives. Acting as a surrogate for the DNC, Thomas asked Canfield if Democrats "need to be on the front lines of trying to explain this better so that Americans can understand" the law, seeing how Republicans had a "policy of fear," trying "scare people into not wanting" it. THOMAS ROBERTS: President Obama there sharing the personal emotional story of a woman who benefited from his health care law. The president says he's carried Natoma Canfield’s story with him every day of this fight to pass the law and then yesterday the Ohio woman was solidified as a national symbol of this president's signature legislative achievement. Natoma Canfield joins me now to talk more about this. It's great to have you with us and we first heard your story when the president invited your sister to introduce him at a health care event two years ago. You were too ill to make it at that time. Let’s start out with update us all on your condition now. How are you doing? NATOMA CANFIELD: I'm doing fine, thank you. The cancer is gone. And I'm just recovering now. It's going to take a long time, but I'm doing well, thanks. ROBERTS: Natoma, you are certainly a fighter. It has to be certainly a validation and an inspiration to you to hear that your letter that you wrote to the president appears framed on his wall. And I want to read part of it to everybody here you say, in that letter, that I need your health reform bill to help me. And how much credit do you give the president's law for your improved health, for the improved life situation that you've seen? CANFIELD: Oh, I give him a lot of credit. THOMAS: Natoma, specifically, explain to all of us, how did it change for you? The outlook, at least, for hope, to recover from what you were facing. CANFIELD: Well, it was a very uplifting experience, to receive both of his letters. And to know that my letter had been heard. So -- those things were very important. THOMAS: Natoma, you're one of the millions of Americans who have already benefitted from this law. What goes through your mind, though, when you hear people on the right. People out there across this country that may not understand exactly what the Affordable Care Act does, and they want to repeal it. They're angry about it. What is your message to them? CANFIELD: Well, first of all, I hope they never firsthand understand how important it is. To be able to have insurance if you've been laid off from a job or something like that. That you can afford. Or you've had a pre-existing condition. But I think that, I guess my message is, that it's going to help a lot of people. And I think people need to look at it and give it a chance. THOMAS: For people that may not have an opportunity, certainly, to walk a mile in your shoes, and the medical heartbreak that you've gone through with the diagnosis and the battle that you've waged since then do you think that the president, do you think that Democrats, need to be on the front lines of trying to explain this better so that Americans can understand more so that there's not a policy of fear that's coming out of this as we've been hearing so much over the last couple of years, trying to scare people into not wanting this? CANFIELD: I think that explanations are always good. People have to listen, also. ROBERTS: If you had the president's ear, which I think you did after he got the ruling coming down. What did you say to him? He called you. Correct? THOMAS: Would you mind sharing with us what you guys discussed? CANFIELD: He asked how I was. And I told him what a wonderful president I thought he was. And he asked about my sister Connie who had introduced him, and said to say hi to her and he asked if I'd gotten an pen from the signing of the health care bill, which we hadn't. They were all gone by the time my brother and sister went up there, and then he told me that I was welcomed anytime to come and see my letter on his wall. THOMAS: Well, Natoma, I'm sure if somebody's watching at the White House right now they can find a pen and get it sent it to you. May not be from that signing bill, but they can find you a pen lying around the White House. Certainly an inspiration as the president said your letter was to him. And you are an inspiration certainly to those with this diagnosis of cancer and the fight that it takes to come back. We wish you the best of luck. The best of health as you move forward. Thank you.